SEOUL -- South Korea said Wednesday that the rival Koreas had agreed to form their first joint Olympic team and have their athletes march together during the opening ceremony of next month's Winter Olympics in the South. Seoul's Unification Ministry said the Koreas reached the agreement during talks at the border village of Panmunjom. It said athletes from the two Koreas will march together under a "unification flag" depicting their peninsula during the opening ceremony and will field a single women's ice hockey team. The measures require approval by the International Olympic Committee. The South Korean ministry said the two Koreas will consult with the IOC this weekend. North Korea plans to send a 230-member cheering squad as part of its delegation to next month's Winter Olympics in South Korea, officials said earlier Wednesday. The two Koreas have been pressing ahead with a flurry of projects to cooperate in the Feb. 9-25 Olympics in Pyeongchang since North Korean leader Kim Jong Un abruptly said in a New Year's speech that he was willing to send a delegation to the games. Critics say Kim's overture is an attempt to use improved ties with South Korea to weaken U.S.-led international sanctions on North Korea while buying time to perfect his nuclear weapons program. Tillerson says North Korea must "earn its way back to the table"
On Tuesday, U.S. Secretary of State Rex Tillerson warned that Americans should be "sober" about the possibility of an armed conflict breaking out with North Korea. He was speaking at a U.S. and Canadian-hosted summit in Vancouver with ally nations aimed at finding diplomatic solutions to handle the nuclear threat posed by North Korea. On Wednesday, China said "Cold War thinking" was behind the meeting of U.S. allies, adding that the gathering risks splitting international opinion over the issue. China was not invited to the 20-nation conclave in Vancouver and foreign ministry spokesman Lu Kang said excluding it and others involved in the matter would not be helpful to finding a resolution. While they have not alleviated the standoff between Washington and Pyongyang, the Olympics moves nevertheless have provided a temporary thaw in the Koreas' long-strained ties and fostered optimism that North Korea won't launch any new provocations, at least during the Olympics. 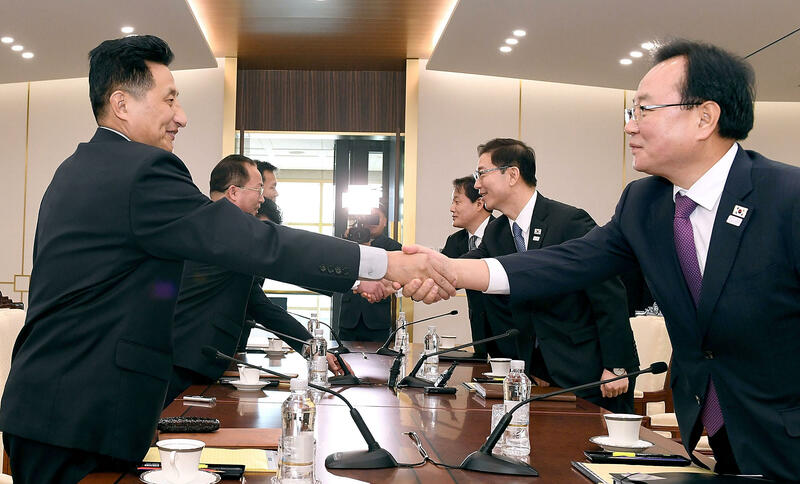 The North's participation in the Olympics "will serve as a chance to warm solidly frozen South-North ties," South Korean President Moon Jae-in said during a visit with South Korean Olympic athletes. "But if we march together (during the opening ceremony) or field a single team, I think that can be a further step in developing South-North relations." Moon spoke while officials from the two Koreas were meeting at a border village for the third time in about a week.